The Charleston Area Alliance Downtown Streetfest is back again this summer launching a four-event series starting Saturday, May 4 with reggae music by The Ark Band from Columbus, Ohio headlining the event. The fun begins with a Kentucky Derby Hat Contest starting at 5:30 p.m. with local celebrity judges and 1st, 2nd and 3rd place prizes. The music begins at 6:00 p.m. and Adelphia Sports Bar will be showing the Kentucky Derby at 6:50 p.m. 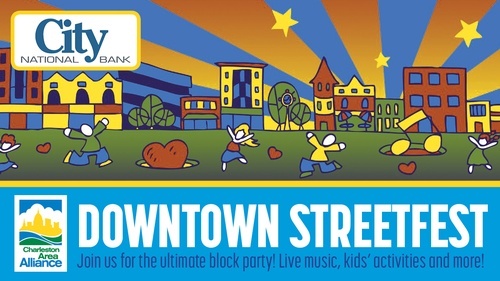 Presented by City National Bank (WV-OH-KY-VA), Downtown Streetfest is the ultimate downtown block party with a mix of live music, food and drinks and kids' activities, successfully supporting downtown restaurants and more than a dozen small businesses in the process. The four monthly events along Capitol Street bring hundreds of people to downtown for a street fair environment including expanded outdoor dining, games and pop-up shops. The event is supported by Suddenlink by Altice, Brewer & Company, Bailey & Glasser, Hendrickson & Long, Mountain State Beverage, Capitol Beverage Co., Spriggs Distributing, Rock 105/The MIX, Tony The Tailor, Taylor Books, The Manahan Group, Buzz, Rock City Cake Co., B. Belle Boutique, Sam's Uptown Cafe, Staples, Adelphia Sports Bar & Grille, Kanawha County Public Library, and City of Charleston. The May 4 Downtown Streetfest is the first of four block parties. Downtown Streetfest are also scheduled for July 13, Dogfest Aug. 10 and Sept. 7. Capitol Street between Quarrier and Lee Streets.